Aikido is a martial art that was founded by Master Morihei Ueshiba (1883-1969). He was one of the greatest martial artists who ever lived, and also a man of peace. He taught that there is always a way to blend with an attackers energy and take control of difficult situations. 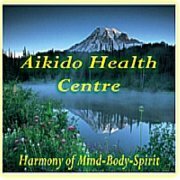 Aikido teaches you how to deal with verbal or physical confrontations in a more harmonious way. This helps you find the best possible solution to any physical, emotional, or spiritual problem that comes up in your life. In Aikido practice, you are usually either performing a technique or receiving it. In this way you experience both the positive and negative extremes of winning and losing. This teaches you all about the natural flow of energy, and how to accept whatever life throws at you. You can see this as important life lessons that develop your experience and character. It is important to attack your dreams and desires the same way you would attack on the training mat. If there is something you want to achieve in life then you have to take massive action and attack that goal. You can be in either the role of the attacker/uke, or the defender/nage, on the training mat, or in Life. Sometimes it is important to attack, while at other times it is important to relax during an attack. You can allow it to happen, and then redirect that energy in a more harmonious direction. You can either be pro-active and go for your goals in life, OR be re-active and wait for them to come to you... which never happens - Right? So, if you are not attacking life, life is attacking you... and you know what that means. Life is constantly throwing difficult situations at you, trying to push you off balance and take your centre away. When uke attacks the first thing you should do is breathe deeply and relax, allow it to happen. The next thing to do is stand strong, have faith in yourself, trust and believe that the decisions you choose are correct. breathe deeply, relax and enjoy your practice of Aikido and life. Copyright © Tony Wilden. All rights reserved.